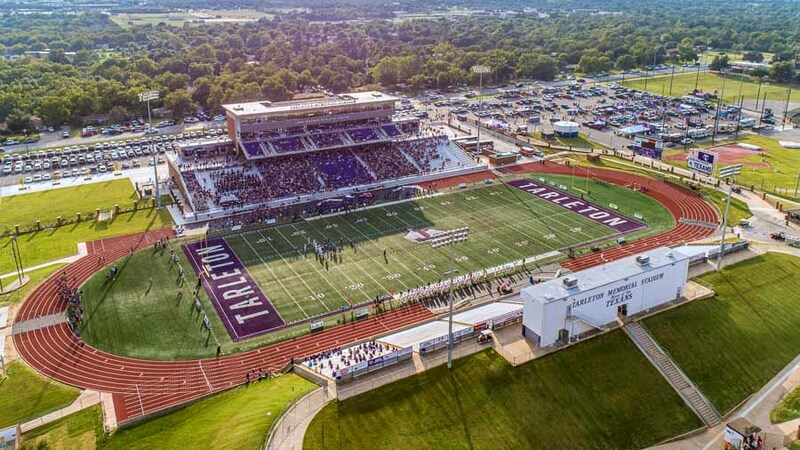 Memorial Stadium at Tarleton State University is currently under a major renovation and expansion project. Additional details and images are available here: www.tarletonfootballrenovation.com. Price tag for original construction - $100,000 Opened - 1951 Named in honor of 179 former students and faculty members who died in World War II. Track named in honor of Oscar Frazier, long-time coach who guided the Texans to 19 state or conference championships. Change seating layout, switching Texan' fans to west side Boost capacity to more than 9,000 seats Install a new playing surface Improve entrances and concessions Enhance the press box. Upgraded field house and weight training facilities. Renovation began - Summer 2017. Anticipated completion - Fall 2018.